:LaeDee Bugg is a girl with style. She is fun and funky and most importantly, she loves God. When LaeDee Bugg is around the sun seems to shine a little brighter and the birds sing just a little sweeter. She lives every day to the full and radiates the joy of the Lord. The LaeDee Bugg Range of products will excite and delight little girls while teaching them about God's love and goodness. Parents will also love LaeDee Bugg for the Christian values she embodies. This wire bound notebook showcases a fun spiral design and encourages girls to live life fully, dreaming big dreams and believing that God directs their steps. It is small enough to slip into a pocket or a handbag. 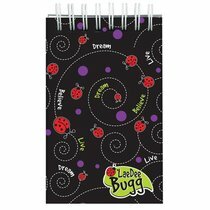 About "Laedee Bugg Notepad: Beetle Swirl With Scripture"